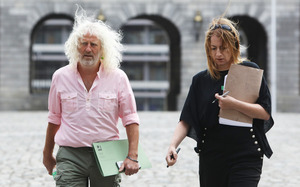 It will be a loss to the Dáil to lose these two. I’m not sure if they will be as useful in the EU. Clare, if elected, will be a huge loss to the Dail. They stand a good chance of being elected too. Given that they operate hand in glove, one wonders what might happen if one was elected and the other wasn’t? Either way, you’d suspect they’ll still be a force. It’s going to be a fascinating election throughout Europe with a few of the old ‘certainties’ likely to be challenged. Wil be great if Mick Ming and daly are reunited in Europe. 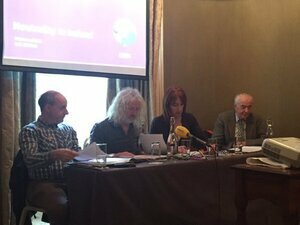 Strong Irish voices. Not really. They’ll be members of fringe parties in a chamber of up to 700 MEPs. How strong do you think those voices are? Mairead McGuinness has been a strong voice (irrespective of whether you support her or not) because she’s an EPP member and, as the dominant party, she has had opportunities for genuine influence at EU level. Lots of loons occupy the European Parliament from UKIP to Polish right wing nutjobs. They are safely ignored. its nothing to do with SF… Fitzgerald doesn’t need SF to call out her disgraceful record in politics. She is well incapable and incompetent in her own right. Why can’t they double job like all the others? Where are all the “noses in the trough” comments that usually accompany any MEP post? I take it your question is rhetorical, rotide. Daly and Wallace are as far as it’s possible to be from the self-serving nose-in-the-trough gombeen clowns of whom the electorate are heartily sick. Are you on glue? 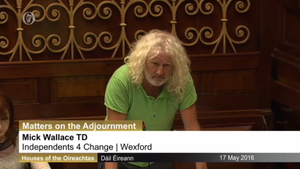 Mick Wallace fiddled his tax returns to save himself millions. Daly maybe, but Wallace is a tax dodging ex developer, like a lot of them, but wears pink shirts. So it’s alright then. I heard that he’d settled that almost 7 years ago. Unless you are referring to a different, new “tax dodge”? Oh, if he only fiddled his taxes and cheated his employees several years ago that’s fine. Its not like previous behavior is ever any indication of character or future intent. I’m not condoning or excusing his past behaviour, but I think you know that. The implication of the “noses in the trough” comment was fairly clear, I thought. Wallace does not strike me as the sort of TD who’s in the job for the salary and perks, and I haven’t heard even the slightest whiff of an allegation of corruption levelled at him. I think that’s remarkable given the cages he’s rattled, don’t you? Didn’t he prevent bankruptcy by becoming a TD? what, apart from lying, defrauding creditors and dodging taxes and transferring assets to his brother while decaring himself bankrupt? And, we’re back to the tax evasion again. Cian. Which creditors did he ‘defraud’? Strange that his lying managed to help oust two Justice Ministers and a Garda Commissioner. Or that his lies shone the spotlight on NAMA and the vultures resulting in investigations on two continents. They are so sick of them they keep electing them!